Good morning and welcome to our first Daily FX Report of this week. From an economic point of view it seems that the week may start quietly with only a few economic data. However, we wish you a good start and successful trades. The JPY started weaker into the new week and fell versus all of its major counterparts as gains in Asian stocks damped demand for the JPY as a refuge. The EUR/JPY touched a two-week high on concern a report may show this week the German business confidence rose to the highest level since July 2008. Also the USD declined against higher-yielding currencies on prospects the lack of U.S. job growth will keep Federal Reserve Chairman Ben S. Bernanke from raising the key interest rate. The AUD traded near an almost 25-year high versus the GBP on speculation that the Reserve Bank of Australia will raise borrowing costs in March again which increase the spread to the U.S. and Europe interest rates. The NZD rose against the USD as crude oil prices rose near to a fiveweek high. Crude oil prices also pushed the CAD to a two-year high against the EUR. During the Asia session the EUR/CAD fell to 1.4136 from 1.4225 at its opening. After the currency pair fell continuously since the beginning of 2010 it seems that the USD stopped its downward trend at 0.6808 on February 5th. 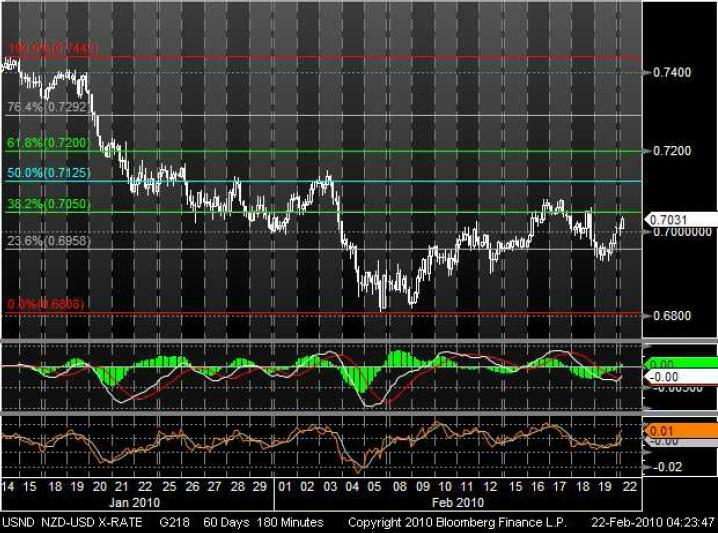 Afterwards the NZD/USD climbed near to the 0.7050 level and tried to cross the 50% Fibonacci retracement line. Now it seems that the USD will make another attempt assisted by rising momentum indicator as well as an increasing MA Oscillator. The USD/CHF has been trading in a mid-term bullish trend-channel since the middle of January. 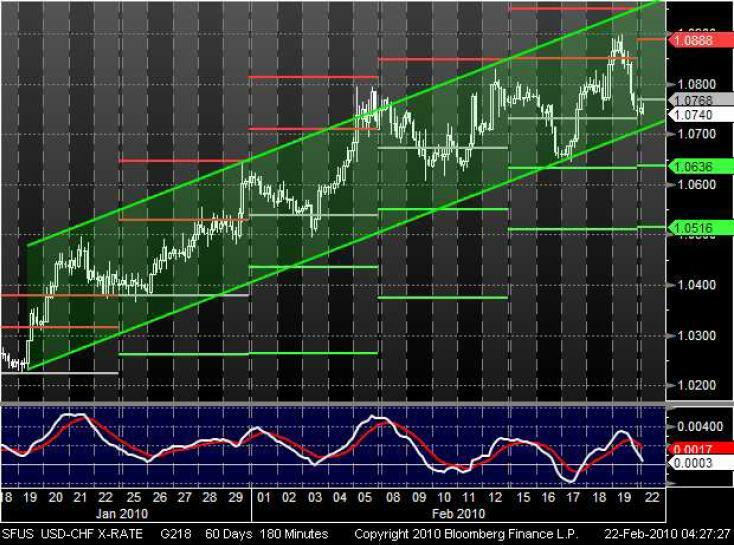 Having the USD lost its pivot point support for several times during the last weeks it is the first time a new week began below the pivot point. In considering of a tumbling MACD we have to allow for further bearish movement. Especially if the lower trend-channel line may break it could boost the bears.